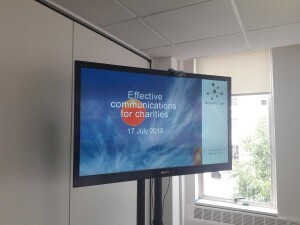 Last week I ran an Effective Communication for your Charity training masterclass on behalf of Small Charities Coalition. With attendees from a range of different organisations in the room we had lots of discussion, lots of practice of communication skills and techniques and some laughs too. They may have come from different organisations with a variety of charitable purposes and objectives, but there was one thing they shared: each member of the group came to the training session with a desire to improve their communication skills and make a positive difference to the individuals, families and communities that they work with. With only 3 hours together, we had a lot to cover and we hit the ground running. We started by ensuring we had a shared understanding of effective communication and what that really means; we moved on to the basics of communication planning; we practised developing audience understanding and putting ourselves in their shoes; we put together some messages; and we talked about the communication methods that might work for them. It was whistle-stop and intense, but participants from small charities are used to doing a lot with their time and wearing many hats. They left ready to take their first steps towards more effective communication as soon as possible. How to simplify complex messages without dumbing down. How powerful it is to put yourself in your audience’s shoes and consider a topic from their perspective. Ideas for reaching out to different audiences with different messages and using different channels, all at the same time. Where to start with communicating internally and how that reflects external comms needs. How you can use research into a funder’s priorities so that you put together a funding application that really speaks to them. If you would like me to run a similar communications trainnig workshop for your organisation, please get in touch.